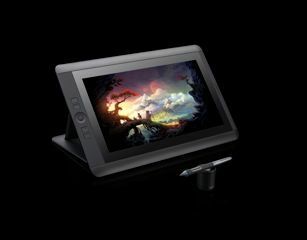 The What: The new Cintiq 13HD from Wacom offers creative professionals a compact interactive pen display with HD resolution and improved pen feel. The product is a new addition to its lineup of Cintiq interactive pen displays aimed at creative professionals working in areas such as design, art, and image editing. The display combines a 13-inch HD screen, adjustable stand, and improved Pro Pen for a digital workflow that feels just like drawing or painting with traditional media. The What Else: Wacom says that the key to the Cintiq 13HD is its compact, slim design and easy setup with both Macs and PCs. It is optimized for use in a choice of four settings — flat, 22°, 35°, and 50°. Frequently used shortcut commands are available via four customizable and application-specific ExpressKeys and Rocker Ring. One More Thing: It's priced at $999.95 (US) and it's scheduled to be available in early April at Wacom’s eStore and other select retailers.